that are highly resistant to chemicals and heat, is an excellent solution for filtering still, fizzy or sparkling wine. It employs important technology that guarantees extraordinary performance at low cost. In addition to its numerous and interesting uses, it is respectful of the structural and organoleptic characteristics of the wine, at times more so than traditional techniques. As no filtering aids are used, polluting waste is greatly reduced. 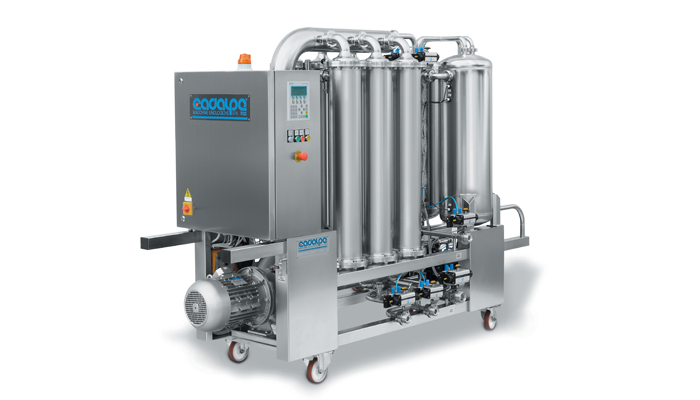 Simple to use due to automatic control of the main process variables, including washing with detergents. Cycle continuity that does not require an operator.